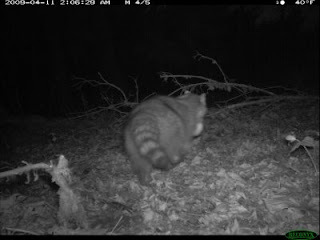 As mentioned in a previous post, I am monitoring a property east of the Sandy River with several trail cameras. 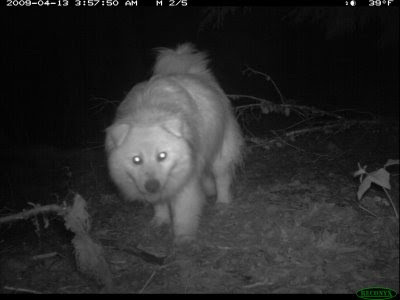 I pulled the cameras off the property when I went bigfooting on the Olympic Peninsula so I could use them in the field, but reinstalled them after I returned. I recently picked up a rumor of a rock throwing encounter with a possible bigfoot on the Sandy River from just a week or two ago. I was particularly interested because the cameras were deployed on the property during this time. I'm quite an optimist, so I visited the site to check battery levels and to see if there were any interesting pictures. 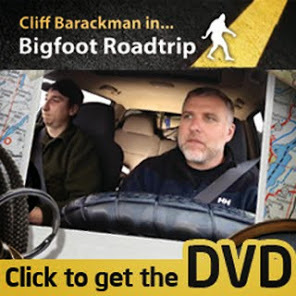 Besides the possibility (however thin) of having a picture of a bigfoot, I always get excited about seeing what other animals are around, and how often they come by. 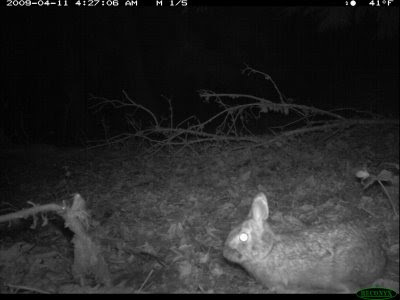 I view camera deployments as successes if they obtain photographs of any animal, bipedal or not. One never knows what might wander in front of the lens. Seeing the inhabitants of an area sheds some light on what sort of food might be encountered nearby. The animals themselves should be looked at as possible prey for a hungry bigfoot as well. This is equally true for domesticated animals such as dogs or cats. No bigfoots were photographed, but quite a few other animals were. 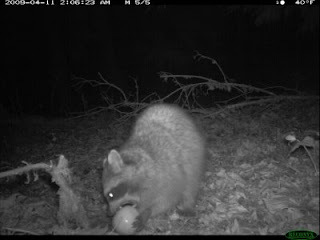 I managed to obtain photos of mice, cats, dogs, birds, rabbits, and racoons. It was interesting to note the time stamps of the photographs as well. This dog got up early. 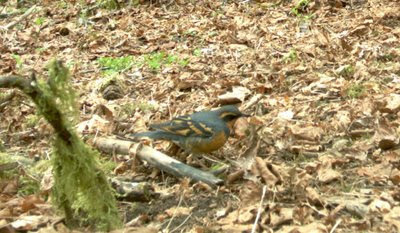 I got quite a few pictures of this varied thrush foraging in the leave litter. Photographs like these offer a great opportunity to try to identify the species of bird without it flying away, as seems to happen to me more often than not while in the field. I think it is noteworthy that no photographs of deer or elk were obtained. I repositioned one of the cameras from the pond area into the overgrown ravine (but not before switching out the malfunctioning camera for one that works). I'll give it a couple of weeks and come back to check up on things. I'm looking forward to seeing more pictures when you get back there. 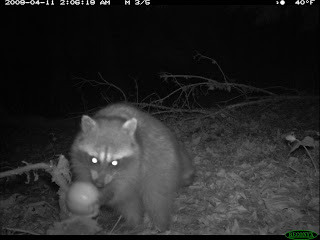 Do you have other trail cameras in other locations? I have permission to work another property nearby the July sighting location. I have not yet been able to coordinate schedules with the owner to deploy cameras, but that will happen soon.